Do you have some cash burning in your pocket? It’s time to check out the brand new slot game from Barcrest – 7’s To Burn, available to play on Slot Games! 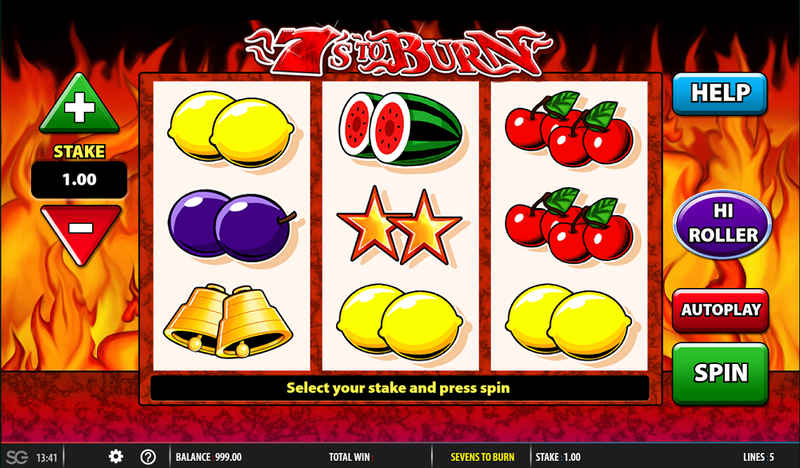 7’s To Burn is a hot new game which takes the form of a traditional fruit machine slot with a twist. This slot is full of bold red and orange colours as the flames creep up behind the reels and add a little fire to the game. You are sure to love this game if you are a classic slot fan and don’t care about complicated themes. When you get spinning on 7’s To Burn, you’ll see lots of 7s appearing on the reels. The fiery 7s are the highest value symbol follows by the regular red 7s. Of course, some of our favourite symbols also appear on this fruit machine slot including the watermelons, the bar symbols and the cherries. Each of the symbols have a simple design but this works well for the theme. You’ll see a few of the bonus feature buttons appearing around the reels which make it easier to understand what you need to do. Barcrest have gone for a simple design making this game perfect for first-time slot players or those who enjoy winning big without a lot of effort. The stake buttons appear at the left of the three reels and you’ll choose the + to choose how much you are willing to bet on each line. Once you’ve done this, all you need to do is press spin and you’ll see brand new symbols replace your old ones and hopefully, you’ll get a prize! Each of the individual payouts are listed on the paytable which you can easily access using the buttons on the main screen. If the fiery seven symbol is attracting your attention, then you’ll be glad to know that it can have an intense effect on your prize fund. If you are able to land one of them on the reels then you will be able to swap it out for a regular 7. This makes the fiery 7 the wild symbol in this game and it can be quite valuable when it comes to increasing your prize fund. Everyone loves to win big but if you want to land a scorching hot prize then you need to take advantage of the high roller feature that 7’s To Burn offers. This button appears on the right of your reels and comes with a great reward if you’re lucky. Choosing this option is a bit of a gamble as you will be buying 5 more spins and it will cost a little more. You should also note that payouts will be half as valuable in this round, but you are more likely to land a winning combination. Barcrest have decided to make the fiery 7s wild for any symbol on the reels during this round so make sure to look out for it! If you are looking for a traditional game which will give you the chance to win yourself a lot of hot cash, then make sure to check out 7’s To Burn. This game is full of fun so get spinning today to see if you can get your hands on the jackpot!